Brianna: One of the wonderful things about reading is that it can transport us to places and eras that we would not normally be able to visit. As a kid, I desperately wanted to visit the frontier era. I wanted to rough it in a cabin with my cozy little family as we hand-sewed our clothing and baked our bread from scratch. I had the romantic notion that it would be so much more adventurous and wonderful than my 1990s childhood. In our frequent conversations about childhood reading habits, Sarah and I discovered that we both loved reading about frontier girls. 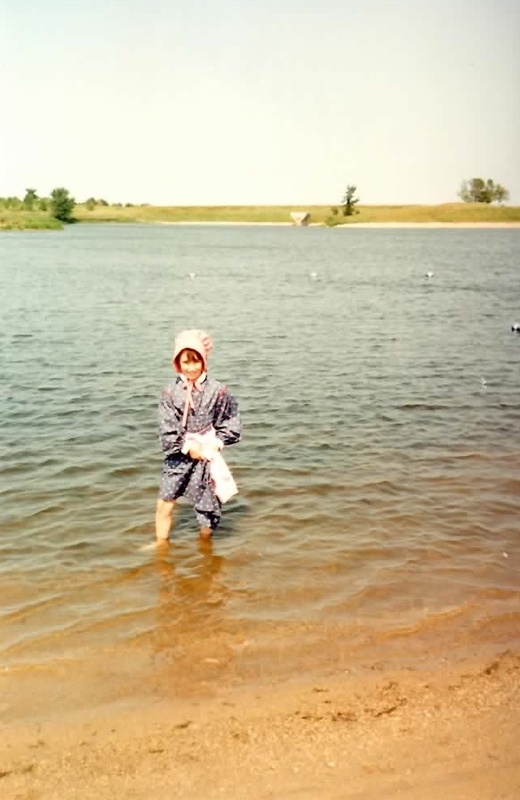 My personal fascination with Laura Ingalls and Kirsten Larson was deepened by my parents, who believed that family vacations should have an educational component and frequently took my sister and I to historical sites. I got to churn butter, peer into log cabins, and sit in covered wagons. For an eight-year-old girl obsessed with historical fiction, it was the coolest thing ever. That’s the replica cabin that now sits in Pepin, Wisconsin commemorating the spot where the Ingalls family lived. My parents bought the rag doll in the gift shop in Pepin. It’s supposed to be just like Laura’s doll in Little House in the Big Woods. I know! And that’s me wading in Lake Pepin, just like Laura did in the book. That was a defining moment, my friends. Those visits to Ingalls family sites cemented my identity as a passionate reader. Sarah: There’s something magical about the frontier. When I was growing up, when we would drive as a family up to northern Michigan, I would look out the window of our GMC Jimmy, watch the trees go by, and imagine we were making this trip by covered wagon. I was so particular about this that I would even plan my outfits accordingly – I would make an effort to wear a dress, or at least a t-shirt with a simple pattern, so that I could imagine I was wearing an old fashioned dress made out of that same material. Weird, I know. I liked my clothing to look old-fashioned – once my grandma gave me a dress with a pinafore and I wore it for two weeks straight. There was a historical reenactment village in my hometown, (Crossroads Village, if you’re looking to visit) and I loved going there more than any other childhood activity, hands down. 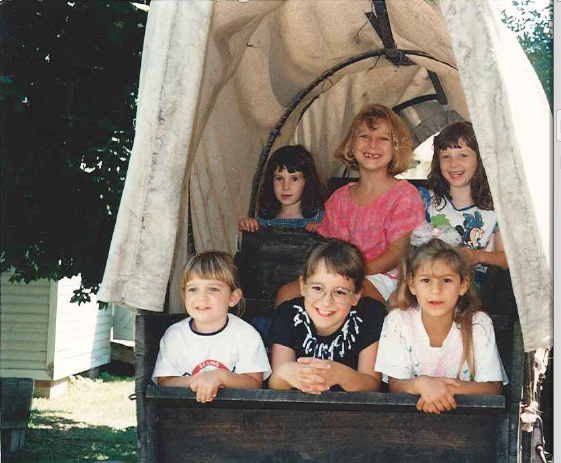 See below, a picture of me, my younger sister, and three of our neighbors inside a covered wagon. 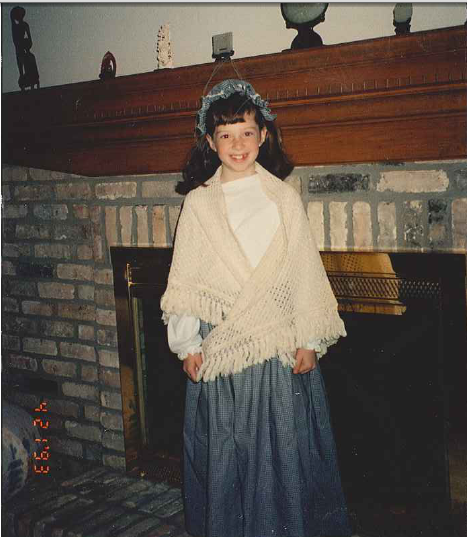 Below that, I am dressed up for a class field trip to Crossroads Village, in which we got to spend a day attending classes in a one-room school house pretending to be pioneers. So yeah, basically the best day of my eight-year-old life. But Laura – there was always something special about Laura. I read the Little House books over and over again (except for Farmer Boy, which I had no interest in because it was about a boy. What can I say, I was seven!) My favorite, without a question, was On the Banks of Plum Creek.Grasshoppers! Dugouts! It was thrilling. I can honestly, and weirdly, admit that I read these books so many times that I’ve even adopted some of the anecdotes as memories of my own. No matter that I grew up in a city in the 1990s – I swear I remember making candy out of snow and maple syrup (it should be noted, my mom swears I did not do this, ever). Because the food descriptions in these books were even more magical than the clothing descriptions. Remember when Ma would use a carrot to color the butter and then let the girls share the carrot? Or the Christmas candy and orange that appears in their stockings in Little House on the Prairie? Even though I’ve been a vegetarian for more than a decade, the thought of a roasted pig’s tail as a special treat literally makes my mouth water. 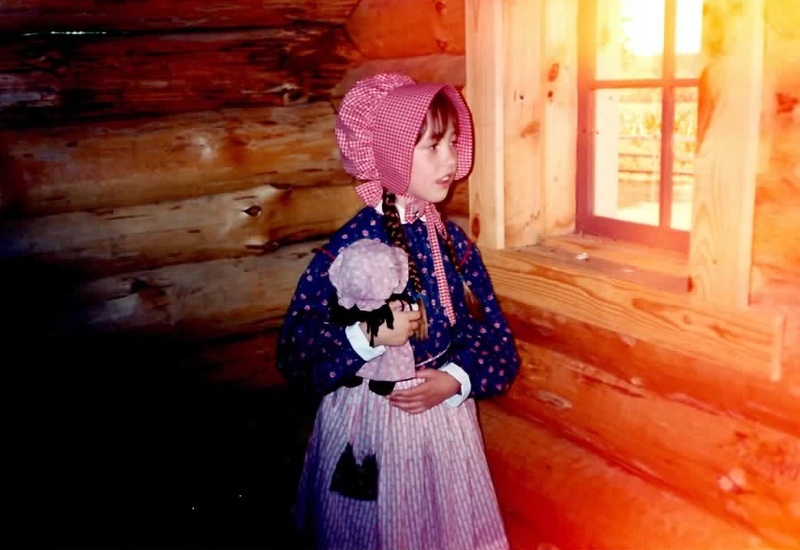 Brianna: To celebrate the impact that Laura Ingalls had in our lives as young readers, we are dedicating this Slatebreakers theme week to frontier girls. We will revisit Laura Ingalls and Caddie Woodlawn and take a look at some newer historical fiction set on the frontier, as well. We will also examine the problems that come along with the historical fiction we loved as kids, including racial issues and problematic nostalgia. Read along with us this week and share your thoughts! Who are your favorite frontier girls and why do you love them? What frontier fiction captured your imagination as a young reader? This entry was posted in Theme Week and tagged frontier, Frontier Week, Historical Fiction, Laura Ingalls Wilder, Little House series, pioneer era. Bookmark the permalink. I am so excited about this! My fave was The Long Winter. I loved the stories of the blizzards and Almanzo and Cap Garland riding out to find wheat to save the town! I feel like there should be some sort of online personality test where your favorite Little House book indicates your personality type! Although I loved Little House, it was the colonial frontier novels that I really loved, like The Witch of Blackbird Pond and Sarah Bishop. Other favorites: Island of the Blue Dolphins/Zia, Sing Down the Moon, Sarah Plain and Tall, and Our Only May Amelia. I remember loving Caddie Woodlawn as a child, but re-reading it recently, there were several unpleasant and unremembered scenes of racism. Little House has them also, which might be why I haven’t re-read them in so long. All good ones! May Amelia wasn’t really around during my childhood, but I love her now. I sympathize with the Caddie Woodlawn unpleasantness…I will be reviewing that book (and talking about the racism and “white savior” theme throughout the book) later this week. Hi Brianna. I’m the webmaster for PepinWisconsin.org LauraDays.org and several other websites in the Pepin, Wisconsin area. I love the pic of you in the cabin and would like to use it on one of the sites if you don’t mind. You look like I would have imagined Laura during that time.